Yesterday I saw a recent interview of Jim Wallis by Chris Matthews about the oil spill in the Gulf. It was in response to Rand Paul’s claim that the Obama Administration is being un-American when they state they will continue to keep their heel on the throat of BP to hold them accountable. The take home messages I garnered from the interview include: it is far from un-American to hold individuals and companies accountable for their unlawful and irresponsible actions; that capitalism has become a god in its own right and not just a means towards an ends; and that we suffer from an addiction to oil that will kill us. 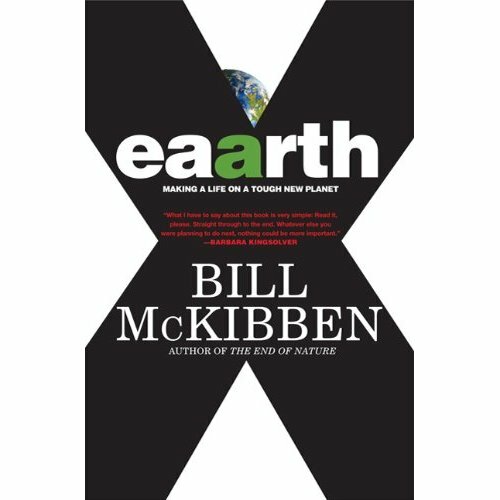 Today I read a book review of Bill McKibben’s Eaarth: Making a Life on a Tough New Planet. The double-A in Eaarth represents in part the AA-style intervention we need at a global level. McKibben suggests our attempts to fix the environment before its too late miss the mark. A man who eats unhealthy food and does so to excess then has a heart attack which destroys half his heart cannot begin exercising and hope to repair the destroyed heart. Neither can we who have over consumed and destroyed our planet hope to repair that damage by exercising restraint now. But we’re not off the hook any more than the over-eater is, and the second half of his book is all about steps we can take immediately and individually to begin living “healthier” to keep our environmental health from getting worse. There are many to blame for this catastrophe, but ultimately we need to start by looking at the log in our own eye or we’ll just continue pointing fingers at others while going nowhere fast towards real solutions. I realize afresh that “doing justice” begins with my daily personal choices. Did I drive today when I could have biked/walked/taken public transit? Did I buy something today that was shipped thousands of miles when I could have bought a local brand instead? Did I eat something today that was produced oversees when I could have just waited until it was in season locally? Did I drink a bottle of water today instead of using my own water bottle and filling it from the tap? How will the choices I made today because of my addiction to oil contribute to the next big oil spill or the next military conflict?